Below are my thoughts from the daily Bible reading of the West Side Church of Christ. Today’s reading comes from Jeremiah 41-45. Before reading I invite you to pray and asked God to speak to you as you read his word. Also above in the tabs is a link to the Bible reading plan. There is something about our reading today that is both heart breaking and refreshing. Jeremiah again shares the words of God with the people in chapter forty-four. This time instead of paying lip service to the words of Jeremiah, or calling him a lying prophet, they simply flat out say we do not care. It is refreshing to finally see a group of people speak honestly. It is heartbreaking that they do not want to listen to God and that they have decided to openly turn their backs on Him. This scene also reminds me of the parable of the seed sower that Jesus told in Matthew 13. The first seed that the sower chucked from his satchel fell on the path. This seed was quickly gobbled up by the birds because the path was to firm to accept it. In essence, this seed fell where those Judeans in Egypt were at spiritually. They were done with God, and they were ready to openly reject Him. They hadn’t seen His blessing because they were half heartedly following Him. Like the path they were hardened and turned their back. Jesus taught us that there would be people who would simply reject the message that we have, just like the path rejected the seed, and the Judeans rejected God. These two passages together reminded me of the example Jesus gave His disciples in Matthew 10:14 to shake the dust from their feet. This teaching was in preparation for His disciples as they went out on a preaching journey. Jesus knew some would reject their message. 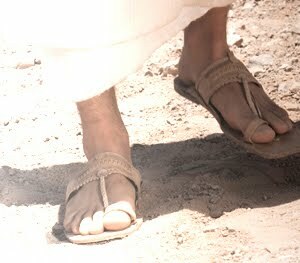 Jesus said to shake the dust from their feet. This was a first century symbolic act to say we are done with you. You rejected us, or brought harm to us, or did not care for us, so as we leave, we are removing the dust of your houses and towns to rid ourselves of you. Jesus was teaching us that our time is precious, and sometimes, no matter how hard and painful it might be, we must focus on good soil, on people willing to openly investigate God. Is this something you need to do in your evangelism of the Gospel? Are you trying to share Jesus with someone who has come to the place that the Judeans in Egypt were at? Have you come to a point where you need to back away, begin to only pray, and invest your time elsewhere? These are things all Christians must consider.